Since university, pasta has been part of my staple diet. 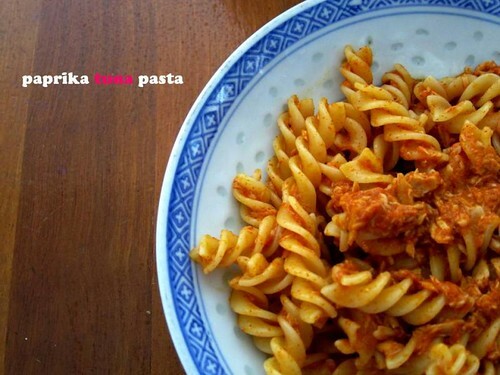 And recently, my favourite is Paprika Tuna Pasta. This is like one of the quickest meals anyone can prepare. 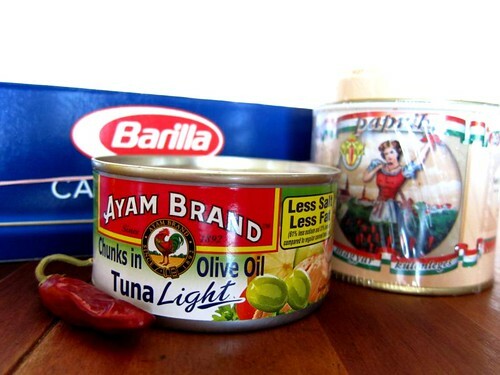 All you need is canned tuna, paprika and pasta (preferably fusilli). If you can be bothered to chop some garlic, please do so. Thanks to my lovely Hungarian friend, Betti who bestowed me her country’s famed paprika – I now do not think I can use any paprika other than the ones from Hungary. Beside the powdered paprika, Betti also gave me some dried paprika which was plucked from her mother’s garden, and those really packed a punch when added in the pasta*. Now I would make sure my pantry is stocked with pasta and tuna. As for paprika, Betti will ensure I am well-stocked. *If you are unable to get hold of dried paprika, you can use dried chilli pepper/ flakes. i think i will cook this tmrw :p dinner for one!